Nikolai Gogol turned popular enthusiasm towards a new kind of realistic prose charged with philosophical anguish. The generation of artists following Pushkin tried to speak the word of God to the people, as artists came to be seen as prophets whose ideas spread like wildfire. Gogol, a small man who came in from the countryside, somehow crushed all these mighty monuments with his satire. Gogol came to St. Petersburg in 1828, an insecure and frightened young man, fresh from the Ukrainian countryside. 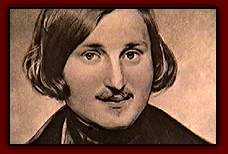 In his early Ukrainian short stories Gogol echoed the supernatural fears of country peopleparticularly in his tale of the nightmarish monster called Vij. See Film footage of Vij. Gogol brought with him to St. Petersburg simple, but terrifying, peasant talesmemories of the Ukrainian puppet theatre. Into the city of great salons he brought the little sprites and demons of the rural imagination. See Film footage of The Overcoat. In his Petersburg Stories, Gogol wrote about an abused clerk deformed into thinking that wearing an overcoat was the highest human aspiration. Gogol inspired many of the earliest Russian films and remains an inspiration to film-makers today. See Film from The Dead Souls. Gogols last and greatest work was Dead Souls, the story of a man named Chichikov who travels all over Russia. Hes on a mission of buying-up dead souls, the titles of the serfs who have died which gives him prestige as an aristocrat. In the process he meets all sorts of caricatures of people living in provincial Russia.